Abstract Wood Sculpture, "On Daddy's Back"
Bending his knees to become shorter, daddy reaches behind him to hoist his child onto his back. The toddler's arms meld with those of his father and their bodies form a single, smooth arc. 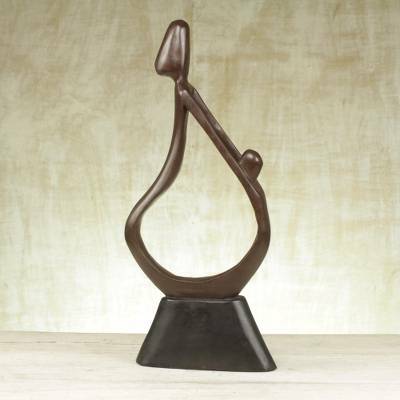 This beautiful example of family love comes from Eric Danquah, who sculpts the pair from African sese wood. Eric Danquah has received 6 microcredit loans with 0% interest from Kiva and Novica, the first for $1000 and the most recent for $800. Proceeds were used to purchase wood as well as sandpaper, polish and wood stain for increased production. "We are four children in the family, among which my junior brother and sister are also talented with the skill of carving. My brother helps me a lot…." Eric Danquah was born on December 12, 1974. He displayed interest in carving as a young man, and would sometimes go around helping the carvers of his community. However, his mother wanted him to be an electrician so she sent him to the city to study electronics. Soon enough, Danquah realized that this was not his calling, and he decided to return home to learn the art of carving, for which he had already demonstrated talent. Says Danquah, "I learned carving from a shop for three years and later established myself with my own shop. I started carving for a full time profession in the year 1997 at the age of twenty-three, and now have one boy I work with. We are four children in the family, among which my junior brother and sister are also talented with the skill of carving. My brother helps me a lot at the shop." Sese wood serves as Danquah's primary material, as he uses chisels, gouges, and axes to extract its natural beauty. My mask arrived in a very timely manner. The carved mask is beautifully carved and is perfect for my decor. Dear Eric, I received my mask yesterday and I love it! It is exactly what I wanted. Really nicely done! Thank you for brightening my day!